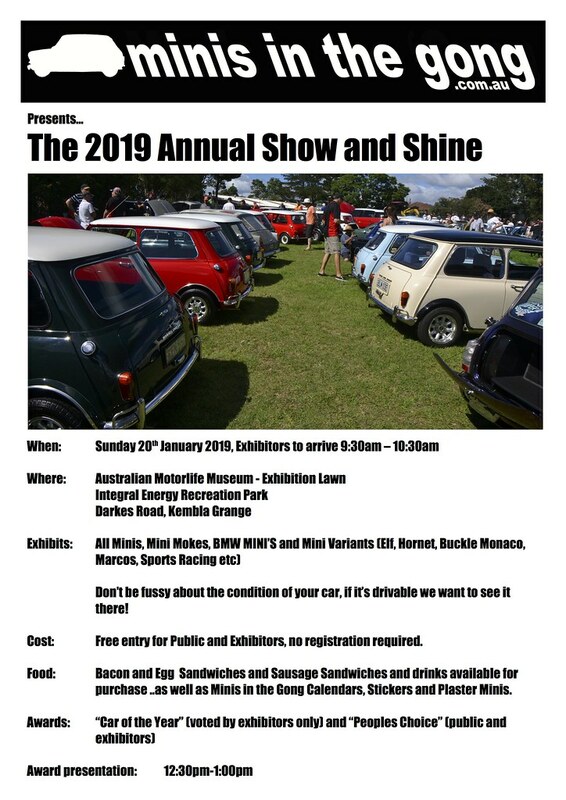 With our 2019 Show & Shine just a few days away we hope everyone is busy preparing their Minis for the Annual Trek down to the Motorlife Museum at Kembla Grange. As usual the show will be in the display grounds behind the Museum. There is no no need to register your attendance at the show and there is no entry fee for the event. Display is open to both Modern and and Classic Minis, Mokes and their variants, as well as other BMC/Leyland models if space permits. We are very grateful to the Motorlife Museum for hosting the event and it is well worth a visit while you are here. We will have our two usual trophies to present. Peoples Choice voted by all in attendance and Car of the year chosen by entrants only. We are very pleased to have 'Mini Works Australia' sponsoring this years trophies. 'Woonona Lions Club' will be keeping us well fed with bacon and egg rolls and sausage sandwiches and 'Smooth Bean Cafe' will be there for your Coffee as well as cakes, smoothies, frappes and iced coffees and milkshakes. We will have a limited stock of Minis in the Gong T'-Shirts available for sale and what we don't can be ordered on the spot. We will also have our remaining 2019 Minis in the Gong Calendars and our Stickers for sale. If you have any questions please don't hesitate to message or email us.